Mirage opening line: By the time the echo from the first knock on his door rebounded off the back of his cabin, Captain Charles Urquhart was fully awake. This book, written together with Jack Du Brul is gripping from start to finish. Juan Cabrillo together with his team aboard the Oregon travel from North Siberia, to China, with diversions along the way to prove that ships cannot be teleported around the world! They have every imaginable weapon and military toy available to them, and in this book make great use of each and every one of them to save the lives of people they are tasked to protect, recover billions in stolen money, and prevent a war! In October 1943 a US destroyer vanished out of Philadelphia, the result of a Navy experiment with electromagnetic radiation. The story was considered a hoax – but Juan Cabrillo and his Oregon colleagues aren’t convinced. They are a force that do not really exist and are a part of the American arsenal that no one really knows about. I have not read every one of the 9 books in this series, but each one is credible enough to make you wonder! Rush out and get yourself a copy of this book. Tandy, Clive lives down the street from me! What a funny coincidence that you were sent this book to review. Sound really interesting, something completely different. Might have tto give it a go. 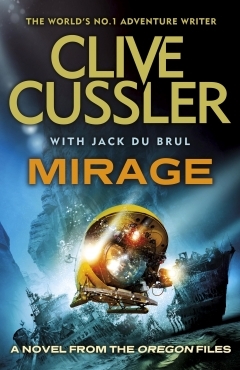 My husband loves Clive Cussler books, nice to know this is a good one. Happy Easter Tandy!